Mount Whitney is the tallest peak in the contiguous United States, standing at just over 14,500 feet. It is visible from the east side of the Sierra Nevada Range, appearing as a granite behemoth flanked on its south by sharp "needles" (e.g. Keeler Needle, Crook's Needle, etc.). 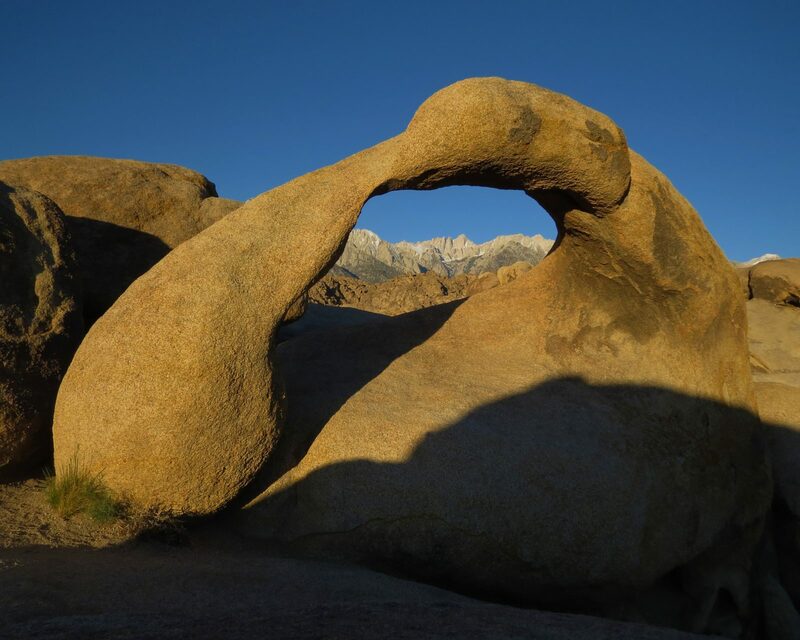 From the Alabama Hills, there are natural, brown granite arches through which one can view Mount Whitney in its majesty. Likely the best known of these arches is Mobius Arch. In this photo, The entirety of Mobius Arch is displayed--and from an angle at which Mount Whitney and its nearby "needles" prominently stretch across the middle of the arch.